Staff Sergeant Christopher Hake, 26, of Enid, Oklahoma was a squad leader on his second tour in Baghdad, Iraq, serving with the 4th Battalion, 64th Armor Regiment, 4th Brigade Combat Team, 3rd Infantry Division. Staff Sgt. Hake and four other members of his squad were on patrol in southern Baghdad when their vehicle encountered an improvised explosive device. Four of the five men died as a result of wounds suffered from the blast. A 2000 graduate of Oklahoma Bible Academy, Staff Sgt. Hake was known as an energetic, fun-loving student who played basketball and baseball. Shortly after his high school graduation, Hake joined the Army and was assigned to the “Old Guard” unit at Fort McNair in Arlington, Virginia. He participated in President Bush’s 2001 inaugural parade and was among those called upon to clear the Pentagon after the attacks of 9/11. As a young adult, Chris enjoyed soccer, boating, skiing, music, and spending time with family and friends. He loved his job and was very proud of his accomplishments. In 2004, Staff Sgt. 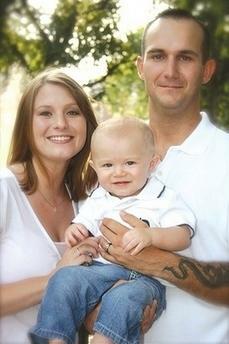 Hake married the love of his life, Kelli, and in 2006 their son Gage was born. The baby was only 19 months old at the time of Hake’s death. Both Kelli and Gage are recipients of Folds of Honor scholarships.